My 9 year old nephew designed this lunch. He is interested in medieval times including knights, weapons and everything else that goes along with it. All I did for this lunch was make the knight helmet pick and follow his directions. He seemed pleased with the results. This entry was posted in Bento / Cute Food, Food and tagged bento, vegan. Bookmark the permalink. A great lunch for our nephew! I love his creative ideas plus he is very fun to be with! I love the castle, what a great idea! This is so cute and creative, I must show my son later!! 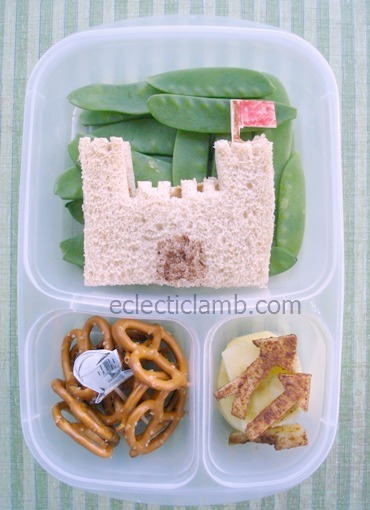 He is into castles and thought my puzzle lunch looks like a castle,heheh. Very nice! How perfect for him! Thank you! He did a great job designing this lunch! What a great lunch, I love the castle sandwich, it turned out beautifully!